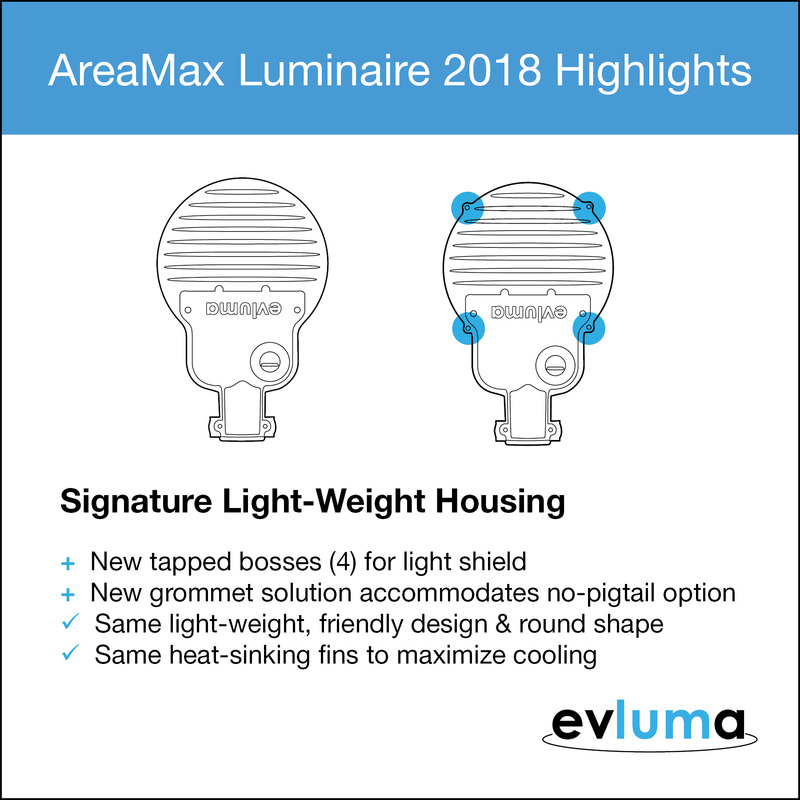 In 2014 Evluma launched an integrated photocontrol option for the AreaMax. With one less part to stock and install, the AreaMax’s popularity with installers shot forward. The FM 4473 certified photocontrol is one of the most robust on the market, but if you want to reuse your old photocontrol that’s fine as well. Photocontrol Failsafe has you covered either way. With the 2018-2019 updates you’ll find we’ve left all these qualities and features intact, but there are a couple of small changes… because you asked for them! We’ve updated the light trespass shield. The updated AreaMax (model AX in the catalog) has four new tapped bosses to accommodate the new light shield. The AreaMax also has a new grommet solution that accommodates a no-pigtail option. AreaMax is also available in multiple color options including black, green and bronze which is growing in popularity. Reach out to any one of our knowledgeable Representatives, Distributors or Sales Directors to find out more!